On Sept. 29, the City of Waterloo hosted a celebration between 6:45 p.m. and 8 p.m., honouring the official opening of the Uptown Waterloo bike lanes running along King street, an undertaking that has been part of the larger “Uptown Streetscape Improvement” joint-project between the City and Region of Waterloo. This event was promoted and arranged by a number of organizations in the region, including the City and Region of Waterloo, the uptown Waterloo Business Improvement Area (BIA), the Uptown Streetscape Improvement Project Task Force and Cycle Waterloo Region (CycleWR). The bike lanes, which are physically elevated from the road, have been given distinct cycling markings, road paint and cycling crossings, and also have been administered no-parking signs and by-laws that are being enforced by both the WRPS and local businesses to discourage vehicle traffic on them. Present at the launch of the bike lanes were many members of municipal government, local businesses and residents, all of whom were clad in their cyclist gear and ready to participate in the evening’s activities. Among them were Mayor Dave Jaworsky, Regional Councillor Tom Galloway, Uptown Ward seven councillor Melissa Durrell and Southeast Ward five Councillor Mark Whaley; as well as some of the Ward seven candidates for the upcoming election, Tenille Bonoguore and Rami Said. The event commenced with remarks from Jaworksy, Galloway, Durrell and Tracy Van Kalsbeek, executive director of the uptown Waterloo BIA. The event then transitioned into a community bike ride on the new lanes, concluding with a display of the new LED lights along its path. In the opening comments, many of the attendees reflected upon the significant changes that the city has undergone, as well as the strength of the community and its durability, enduring the construction that has plagued the area and its businesses. “During the last three years, I’ve [been] struck by the resilience of those business owners and I want to acknowledge the [city’s] toughness throughout this construction,” Durrell said. She optimistically discussed the conditions that uptown residents and businesses have adapted to, sharing words of wisdom that echoed against what seemed like endless uptown construction. “[But] we’re tough, no doubt — four out of five years of construction has made us that way. And there is beauty in that toughness,” Durrell continued. Van Kalsbeek also showed her excitement about the completion of the bike lane construction. “We’re super thrilled, as you can imagine … we’re also showcasing the new LED lighting that’ve gone in … 16 million colours, if you can imagine,” Van Kalsbeek said. Emily Slofstra is the chair of CycleWR, a cycling advocacy group that is currently working to make cycling safety an election issue. As an avid cyclist, she is equally delighted about the new lanes; but as a parent, her feelings are mixed. 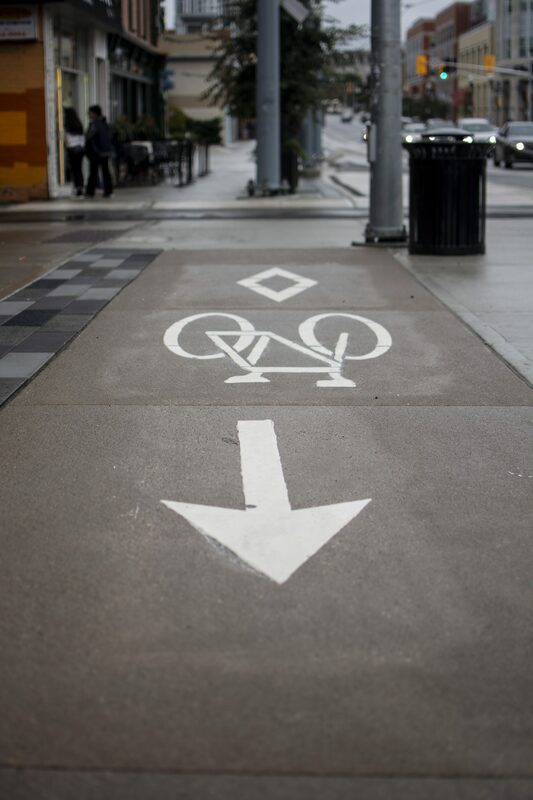 “The uptown lanes are better than a lot of other bike lanes in the Region … I can bike with my kids in uptown now, which is great, but it’s still a little bit nerve-wracking because they aren’t actually protected,” Slofstra said. Slofstra gave detailed insight into some of the frustrating obstacles she sees as a fantastic opportunity for the city to improve upon and grow in the second phase of the bike lane project. “Even though they’re open, there’s still no bike racks … It would have been nice to see some bike racks tonight … [But] they do have the bike valet, which is really great,” Slofstra continued. The region has plans to expand the bike lane project north of Bridgeport Road and towards University Avenue over the next three years, but this will take place following consultations with the uptown Waterloo BIA and the city, as well as environmental assessments in the area.